Today I did our Keeper Chat at the zoo. I had asked to do this talk because I felt for one of the first times, I had an angle that could hook folks into listening and acting. Blah blah blah about the elephants. They receive phenomenal care, they get tons of enrichment. Yada yada yada. We take such fantastic care of our elephants because they have an incredibly important job here at the zoo. They are here to not just teach you about elephants, but more importantly, about elephant conservation, and how you can help elephants in the wild. Because, unfortunately, Asian elephants aren’t doing so great in their natural environment. There are estimated only 30,000-35,000 left in the 13 countries they are found. Some scientists believe that if we don’t do something to help, this species could be GONE within the next 20 years. And what a shame it would be to lose such a majestic animal, especially when saving them is super easy. You can do it while you grocery shop! How many of you made resolutions this year to eat healthier, or simply be healthier? What if I told you by following one simple guideline, you could not only eat better and healthier, but you could save elephants and other Asian wildlife as well? Would you want to know what that is? Stop consuming processed foods. That’s it. So simple! So easy! And it will make a world of difference to your health and the future of elephants. Don’t believe me? Last year, I weighed 50 lbs heavier than I do today. Now, I’m not going to lie, it wasn’t JUST my eating habits that changed, I exercised (like, a LOT), and counted calories, but one of the best things I ever did for my body was stop consuming processed foods. And for me, it was easy to avoid them, even when I was tempted, because of one ingredient that is in all processed foods. How many of you have heard of palm oil? Palm oil is beginning to gain a lot more attention, and it’s important that we do start paying attention to this product. Because it’s in EVERYTHING! It’s in so much food we eat, household products, health and beauty products, pet care products. Don’t believe me? Next time you go to the grocery store, take a look at some of your favorite foods. Look at your ice creams, cakes, pastries, candies, chocolate, cookies, granola bars, lunch snacks, fruit snacks, protein bars, peanut butter, cereals, you get the idea. It’s in everything! So we should be paying attention to what we are consuming on a daily basis. You know, for our own health. But we should pay attention to palm oil also because it can have such a negative impact on wild populations of Asian animals. 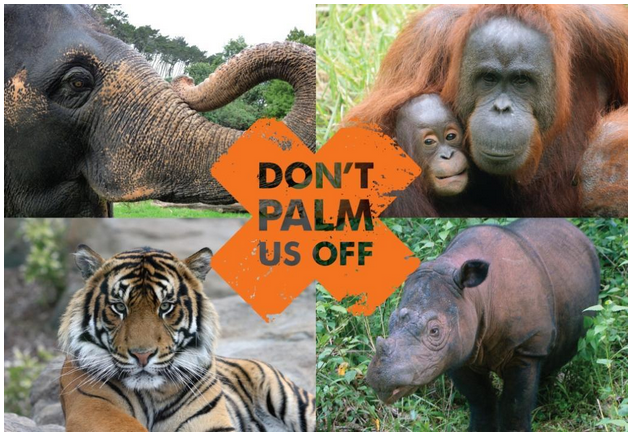 Most directly affected are orangutans and elephants, but palm oil affects all Asian primates (gibbons, langurs), tapirs, pigs, tigers, rhinos, hornbills, bats, basically if it’s an Asian animal, it is affected by the palm oil industry. Unfortunately, too, it won’t be long until we start adding African animals to those affected by palm oil, because it has gained such popularity as a product, that palm oil plantations are starting to expand out to Africa as well. So how does palm oil affect all these animals? Well, unless it’s farmed sustainably, palm oil has severe negative effects in two particular ways. First is the deforestation/habitat loss. Palm oil plantations take thousands of acres to produce their crops. Most plantation owners simply want the forest gone without thought of who might call that forest home or at least a food source. So they slash and burn the forests to make way for their palm plants, leaving orangutans and elephants homeless or without food. The effects can be devastating. The second issue is that the palm plant is a source of food for elephants and orangutans, and now that there isn’t any food available to them, they are now forced to find other food sources. Which the plantation owners have to protect. Unfortunately, again, this is often done at the expense of the animal they are warding off. Poison traps, electric fences, and firearms are some of the most commonly used methods of protecting crops. 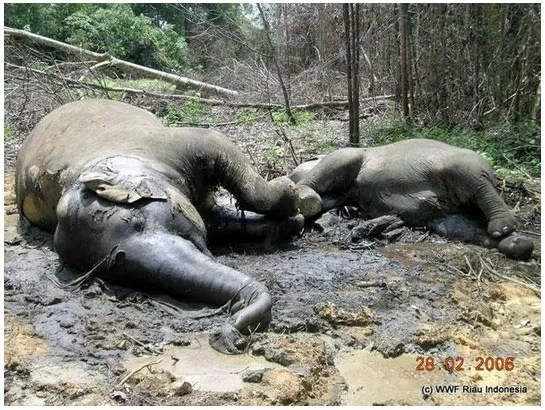 Elephants and orangutans may not be able to survive this palm oil crisis. Unless we step in to make a stand! We can make a difference, and that action doesn’t just have to be good for the elephants, it can be good for you, too! 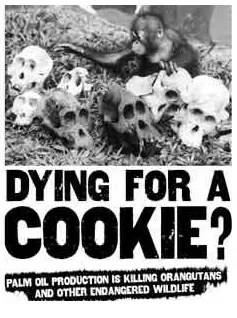 So, next time you are roaming around the grocery store and are tempted to buy your favorite cookies, take a look at the ingredients, remember what kind of effect that one simple ingredient can have on such a magnificent animal, and put it back down. If you want to make a larger impact, I encourage you to contact your favorite companies and urge them to ensure they are using sustainable palm oil. Palm oil from smaller farms that work with the land to conserve space for orangutans and create corridors for elephants. These farmers use sustainable and non-lethal methods of protecting their crops, such as moats and even chili peppers surrounding their oil palm crop (because elephants love lots of food, but the one thing they hate? Chili peppers). 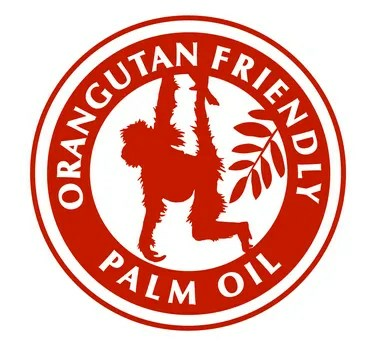 If you can’t go another day without peanut butter or something, look for the sustainable palm oil symbol on products. Be good to yourself this year! And help elephants too! The earth thanks you. I thank you. And so do Chai and Bamboo!